This old world traditional method employs a slow lactic acid fermentation process which takes over 11 months in barrels. 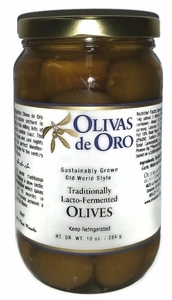 The olive achieve a full and robust flavor. Sevillano olives in a sea salt, water and garlic brine.